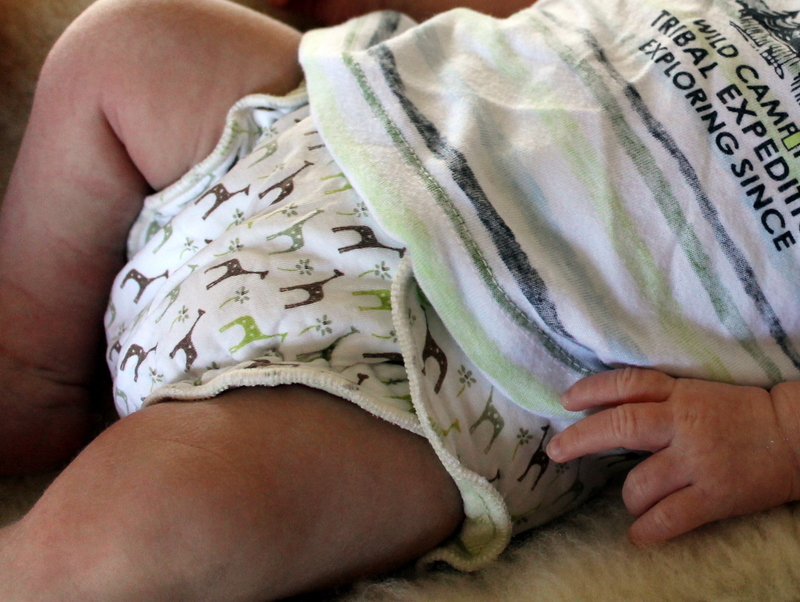 I looked into using modern cloth nappies (MCNs) when I was pregnant with our first baby. The world of MCNs is vast, slightly bewildering for beginners, a bit expensive and quite addictive. I tried a little bit of everything. 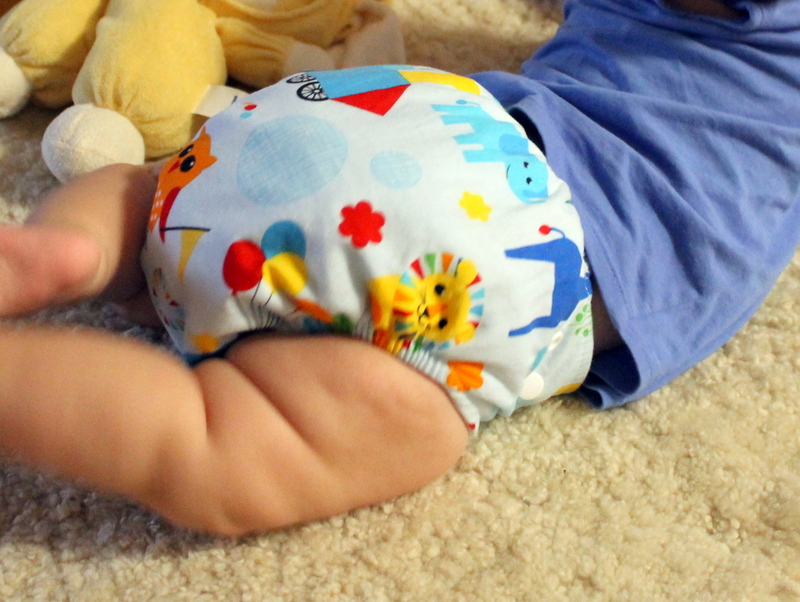 I bought a pocket nappy, a bamboo fitted, an all-in-two, some hybrids… but in the end I decided to use prefolds and PUL (polyurethane laminated) covers. 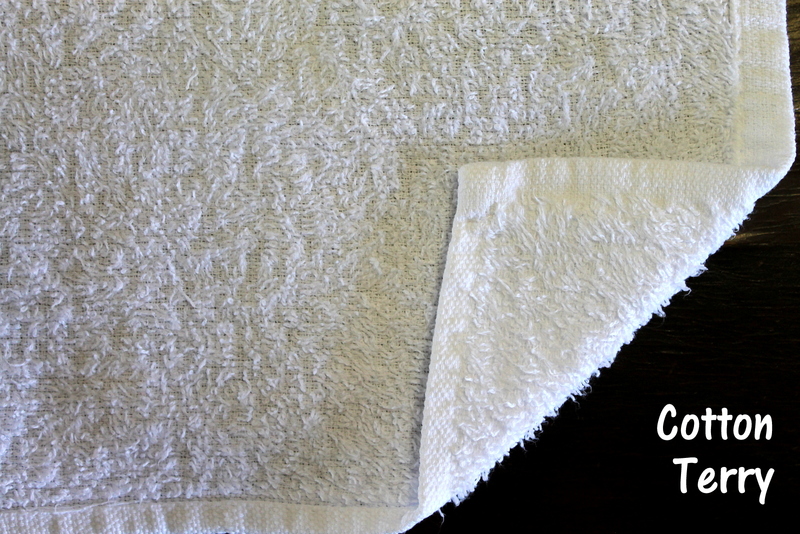 When our 1st baby outgrew those I tried some good old-fashioned cotton terry squares, or flats, and -duh- couldn’t believe how easy they were to use. I had been scared away from flat nappies by MCN advertising: “no pins! no folding! no soaking!” Flats are made out to be really hard work. And they are not. Flats in the MCN world are the nappies that your mum or grandma would have used, depending on how old you are. They’re just a flat, square/rectangular piece of absorbent fabric that you fold into a nappy shape and then fasten on to your baby with a snappi or safety pin. And they are very easy to launder and dry. Unlike MCNs, flats don’t have elastics that can go slack, velcro that can go fluffy, snaps that can fall off, or PUL that can de-laminate. If you had to, you could boil them and bleach them and they would still come back for more! By the time I was pregnant with our second baby I had discovered the wonderful world of 2nd-hand MCNs. In this world you can buy used or “pre-loved” cloth nappies, sometimes in excellent as-new condition, for half or a third of the price of the same nappy bought new. So I decided to treat myself and our new baby’s bottom to some newborn fitted nappies. 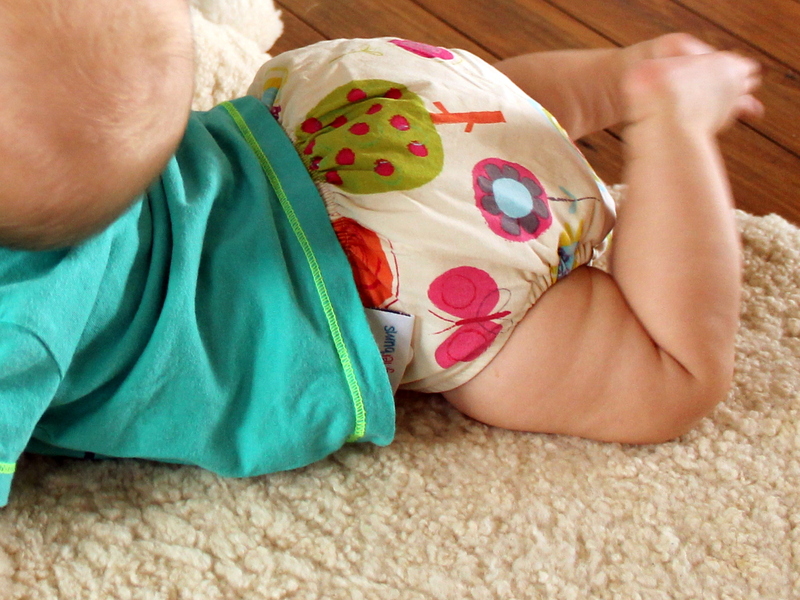 Fitteds are modern cloth nappies made from all natural fibres like cotton or bamboo or hemp. Fitteds don’t contain a waterproof PUL/fleece layer so, unless you use a cover over the top of them, you’ll feel or see when your baby wets themselves. And that’s exactly what I wanted because I like to change my babies as soon as they wet themselves rather than change them by a schedule, say every two or three hours. Plus the prints on some fitteds are just too cute to cover up. And then our baby grew, and grew, and grew, and suddenly our pretty fitteds no longer fitted. And the wet season was looming. Fitteds take about a day to dry here in normal weather and two or more days to dry when it’s wet. My mind turned to the stash of flat nappies I still had. 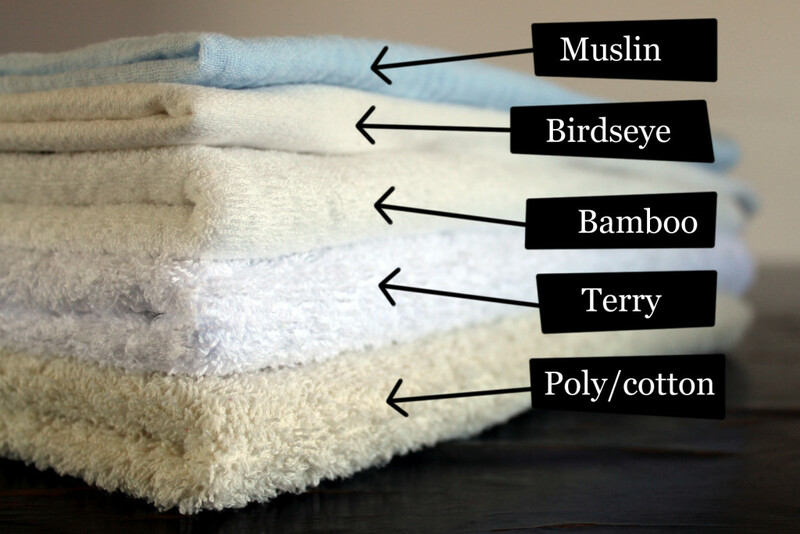 Pictured above is, from top to bottom, and thinnest to thickest: cotton muslin, cotton birdseye, bamboo terry, cotton terry, poly/cotton terry. And no, that’s not my entire stash, that’s just one of each kind that I have now. I started out two years ago with traditional cotton terry, then gradually added birdseye, muslin, poly/cotton and, most recently, gorgeously soft ‘luxury’ bamboo. I’ll describe each in more detail below. And you can click on each picture to see a close-up of the fabric. Target 3 pack, 60x60cm, 100% cotton, rolled hem edge, pastel blue colour. Cotton muslin is a very thin fabric that many would use as a lightweight baby wrap in hot weather but it is an ideal newborn nappy. It is much trimmer than a standard cotton terry on a little baby and is very quick drying; newborns go through a lot of nappies! 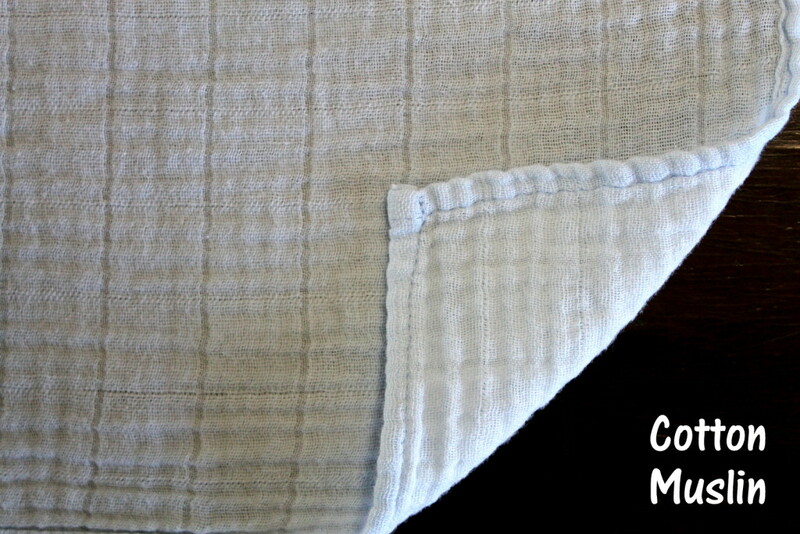 OsoCozy 12 pack, 65x55cm, 100% cotton, rolled hem edge on two sides, natural off-white colour. 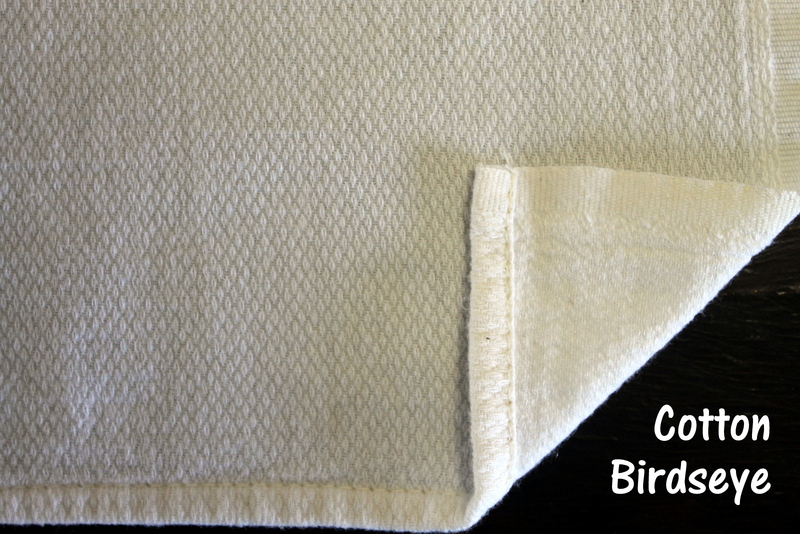 Cotton birdseye is also a lightweight fabric, trim and quick drying, ideal for newborns. It has a distinctive weave/pattern that makes it easy to fasten with a snappi. When baby outgrows them you can also use birdseye flats, like I do now, pad-folded in a wool/PUL cover. Homemade (8), 60x60cm, 70% bamboo 28% organic cotton 2% polyester, over-locked edges, natural off-white colour. My bamboo double terry flats are trimmer and softer than the standard cotton terry flats, and, as the fabric is a knit not a woven, it has a slight stretch to it. This stretch makes for a very comfortable fit. They are trimmer than cotton flats but have the same absorbency. These are my favourite flats! I bought the fabric from the Bamboo Fabric Store. If you want to do the same I recommend buying some samples first to wash, to test with a snappi, and to run through your sewing machine. And then make sure you get your numbers right when you order. I ordered 3 metres thinking I could get ten 60x60cm squares out of it… but I didn’t add on any space for hemming/overlocking – duh! 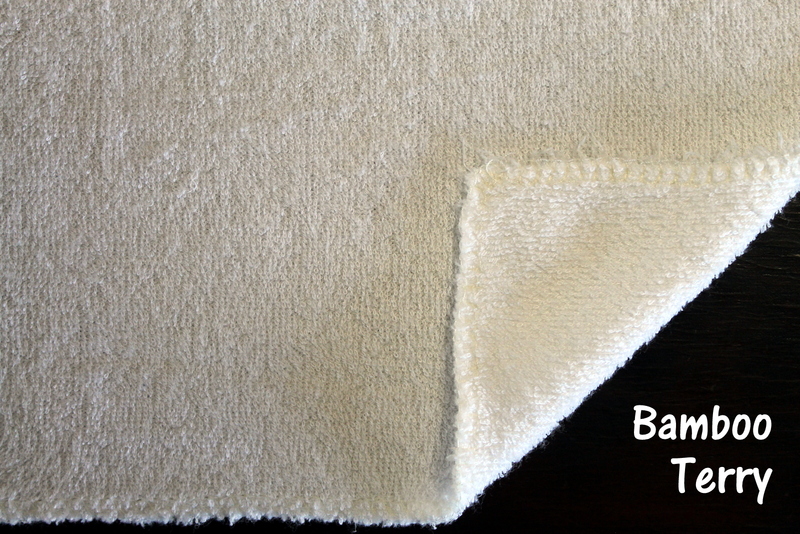 Target 6 pack x 2, 65x55cm, 100% cotton, rolled hem edge, white colour. Classic cotton terry nappies, my 2nd set of flats, and the same brand that we were given at the hospital. My first set of flats were cheapies that I turned into training pant pads because they frayed so much. These Target flats have been washed countless times. They are very absorbent but also a little crunchy. 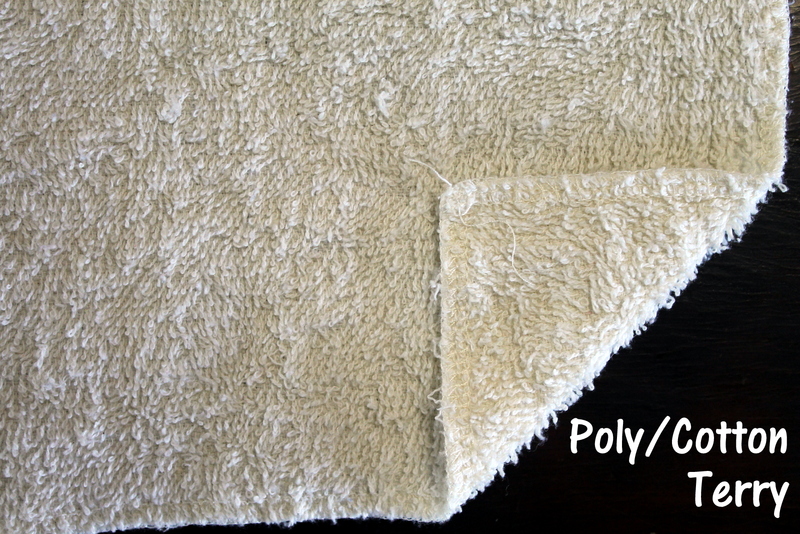 Homemade (6), 60x60cm, poly/cotton mix, over-locked edges, natural off-white colour. My poly/cotton flats were made from fabric I picked up in a sale at Spotlight. I didn’t think at the time that terry would be anything other than 100% cotton, but these dry quicker than the cotton and bamboo flats, and the fabric has a softness and spring to it, and they’re not as absorbent as the cotton/bamboo flats, so I’m convinced that these have a bit of poly in them. There you have it – my stash of flats. I find them easy to wash. When they come off the bum they go into the laundry bag as is. If there’s poop, it is plopped into the toilet, the nappy is wrapped up in itself and it also goes into the laundry bag. In the morning I give the nappies a quick rinse in a bucket to dilute the pee and remove any stuck-on poop. (I used to do this pre-rinse in the washing machine but it’s quicker to do it in the bucket.) Then I throw them in to the washing machine with the clothes or the towels. I find them easy to use. I fold them into a nappy shape using the Jo fold or the origami/bat fold either when they come off the line or as I’m putting them into the cupboard. 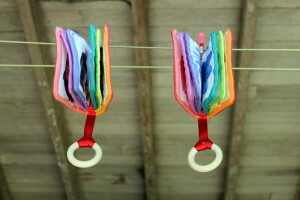 Or I fold them just before fastening them onto baby. The folding and fastening (with a snappi) takes less than a minute to do. But you don’t have to do a ‘fancy’ fold, you could just simply fold them down into a rectangular pad and put the pad in a cute cover. Here are some of the PUL covers I have, made by Designer Bums and Pepper Place. Hey Deborah, couldn’t agree more with you on using natural materials and PUL covers on a minimal basis. When using without a cover, what material and fold did you like the most so they look nice and snug? Assuming you used pins and not a snappi when using without a cover.